An object-oriented take on a previous Processing task. In order to gain additional experience with Processing, I recently looked back over some of the past work I have done in the environment. I decided to modify the image manipulation code I showcased here and improve it with more advanced functionality and object-oriented principles. In order to stick with the same ‘blocky’ aesthetic from the original sketch, I decided to again split the apple image into squares, however this time I applied a simple form of random motion to the resulting squares so that they would move around the canvas. In order to achieve this effect, I first declared a class for the squares of the image, named simply ‘Agent’. I thought about the properties the squares would need to have, as well as the functions they would need to carry out. The necessary fields for the class were an x and y coordinate, as well as a colour value for the square. 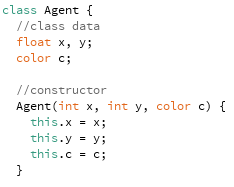 I defined these as variables and created a constructor which would initialise the ‘Agent’ objects created and allow these values to be passed to the object. The methods of the Agent class. The functions the class required were pretty simple. The squares generated from the image would need to do two things – first they would need to move in a random manner, and then they would need to be drawn to the canvas. To achieve this I created two methods for the class – update and draw. The update method simply assigns new values to the x and y variables one greater or smaller than the current value. The draw method sets the fill colour to be used as the colour value passed in to the object in the constructor, and then draws a rectangle at the location defined by the x and y values of the object. This rectangle is currently always 10 pixels in width and height, although this could also be controlled by a variable. It would be best to do it that way, however since this is simply a small practise exercise I chose to hard-code the value. With the class and its methods and fields defined, I moved to the main functions of the program that would make it work. 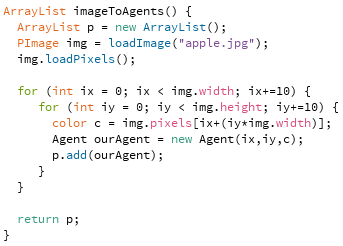 This is split into three main sections – setup, including setting the size of the canvas and creating a list for the agents to occupy, a function to load the image and populate the list with its pixels, and the main draw loop, which reads the list and calls the update and draw methods of the agent objects it contains. The set-up code of the application is mostly simple – the size of the canvas is declared and the stroke is set to 0. A global ArrayList variable is also declared called agents. ArrayLists are useful constructs since they do not need to have a fixed size. This is useful in this situation as I do not necessarily know beforehand how many Agent objects will be produced from the image. This ArrayList is then given the value of the returned variable of the imageToAgents function. This function creates a new temporary ArrayList named ‘p’. It then declares an image variable and loads in the ‘apple.jpg’ image which I used before for the previous image manipulation example. The pixels of this image are then loaded. What follows is a nested for-loop, which simply iterates through the array of pixels loaded from the image in increments of 10 on both x and y axes. The colour value of each pixel is found, and a new instance of the Agent class created with the x and y coordinates and colour set to match the pixel from the image. This object is then added to the ArrayList ‘p’. After this is complete, this ArrayList is returned, so that the ‘agents’ ArrayList receives its values. 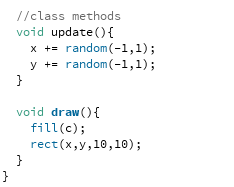 The main draw loop simply iterates through the ‘agents’ ArrayList, creates a temporary Agent object with the values of the object at each position, and calls the update and draw methods defined within the Agent class for each one. This causes the squares with the colour obtained from the loaded image to be drawn to the canvas and move around randomly. I’m pleased with the final result I produced here, and this task has afforded some useful practise with classes and objects, and the ways in which they can be used to create a visual project in Processing. These principles and techniques are likely to be very useful not just in the creation of my final interactive project, but also moving forwards with my programming abilities in general.